- Publisher Hahn sheds new light on the dilemmas clergy and laity, men and women experience as they seek to be mature leaders who are authoritative but not authoritarian. Brings together the experiences of interviewees with the picture of authority in the Gospels to produce a ground-breaking understanding of how to grow toward faithful, integrated authority. Each chapter ends with questions inviting you to reflect on your own experiences and grow in faithfulness and competence. 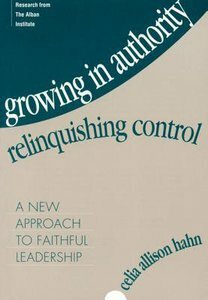 About "Growing in Authority, Relinquishing Control"
Hahn sheds new light on the dilemmas clergy and laity, men and women experience as they seek to be mature leaders who are authoritative but not authoritarian. Brings together the experiences of interviewees with the picture of authority in the Gospels to produce a ground-breaking understanding of how to grow toward faithful, integrated authority. Each chapter ends with questions inviting you to reflect on your own experiences and grow in faithfulness and competence.